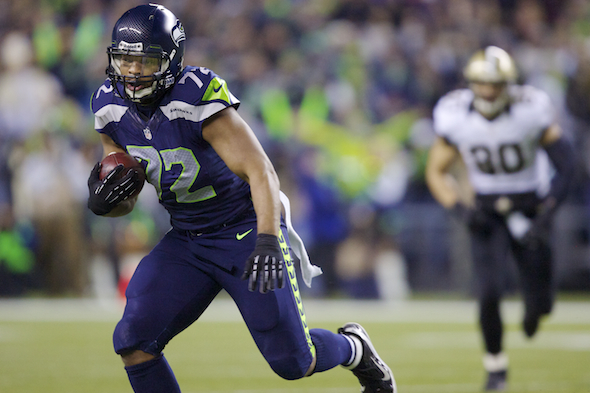 DE Michael Bennett is out of Sunday’s game in New Orleans, and may require surgery to fix cartilage damage. QB Russell Wilson, however, made it through practice and will start despite a sore pec. QB Russell Wilson, however, despite a pectoral injury Sunday after previous injuries to an ankle and a knee is “ready to go,” said Carroll, who claimed Wilson was “hit” in the chest muscle. Bennett hurt his knee two weeks ago during a cut block in the Atlanta game, but managed 81 snaps in Sunday’s 6-6 tie at Arizona. “His knee bothered him coming out of the game,” Carroll said. “He had a little swelling Monday and Tuesday. It might be related (to the Atlanta injury). It popped up during the (Arizona) game. Nothing showed after the game in Atlanta. When Bennett met reporters Thursday. he gave no indication that he would be out. Club policy is to permit no media contact with injured players. “That was very difficult,” Bennett said of playing Sunday with the sore knee. “I think Brett Favre said it best: When you can play really great when you’re injured, that’s when you become a great player. Bennett has played through numerous injuries and has not missed a game since his 2013 arrival in Seattle. At least some of his snaps will go to DE Frank Clark, who has played well this season as a backup, as well as rush end Cassius Marsh. The Seahawks signed to the 53-man roster Malliciah Goodman, 26, a 6-5, 276-pound fourth-year vet out of Clemson, from where he was drafted in the fourth round by Atlanta. He started 28 of 34 games for the Falcons over three seasons before being waived on the final cutdown Sept. 3. Since OLB Kevin Pierre-Louis will also miss the game (ankle) that means three defensive starters are out. The news was a little better for the offense: WR Tyler Lockett was cleared to play despite being kneed in in the thigh during practice. His knee problem “is all but gone,” Carroll said. And LT Bradley Sowell will be a game-time decision after a knee sprain at Arizona forced him from the game. If he can’t go, rookie undrafted free agent George Fant, who finished the final 24 saps Sunday, is “likely” to replace Sowell, Carroll said. A special teams casualty is DeAndre Elliott, who has had a hamstring inflammation problem that will keep him out awhile. Rookie Tyvis Powell will fill in. Overall on defense, Carroll said the unit bounced back well from the grueling 95 plays in the Arizona game, after which numerous players were rehydrated with IV bags. Bet bennett wishes he was able to sign a new contract. He could be considered “old” and ‘damaged goods” when John decides to renegotiate, if he even does. I hope Kam is ok – this is his third missed game, bummer. so wilson can’t run (proven last week) and now can’t throw the deep ball (proven last week)…..Boykin must be a complete turd as a QB ! He dropped a 31-yard dime on Kearse. And Carroll said he’s expected to run better this week. Note that his ankle sprain is no longer listed on the injury report.